my favourite trip accessory by far is a small compass. in vancouver everyone knows that the mountains are to the north so it is pretty easy to navigate. however, in a flat place with few natural landmarks or in a busy city, a compass can be really useful. just remember that the top of any map is north. 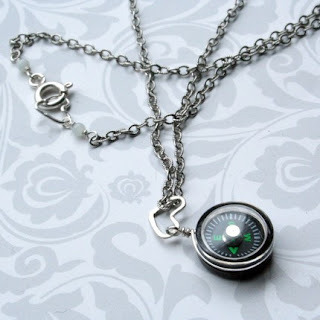 i am on the lookout for a lovely compass to wear all the time and this would be perfect. my best girlfriend and i are off for a few days of shopping and sun in sin city. looking forward to shopping, good food, a big bed to myself, and sitting by a pool with a stack of trashy magazines. and of course having a great time with my closest friend who has been like a compass through the good and the bad for many, many years. Hope you had a good time in Vegas just relaxing and having fun. Thanks for the comment you left on my blog. I still need one more person for the 'pay it forward' giveaway so if you'd like to play and send out a handmade gift to 5 people, then send me an email with your details and I'll send you a gift out in the next week or so... :) Have a great weekend! That compass necklace is super cute! A definite necessity! I found your blog via Jac (cocosunday) and its lovely! Will keep checking back.